Esh Border Construction are to begin work on a £3m transformation of the Calton Hill observatory, Edinburgh, later this week, realizing long-held plans to create a new restaurant and gallery space within the hilltop observatory. Intended to open access to the 19th century scientific facility the works will include a restaurant with panoramic views over the city that will be illuminated at night to signify the ‘landmark attraction’ when it opens in October 2017. Below ground a subterranean gallery space will be carved out to provide space for artists, audiences and producers to come together whilst preserving astronomical instruments and telescopes, which will go on public display. 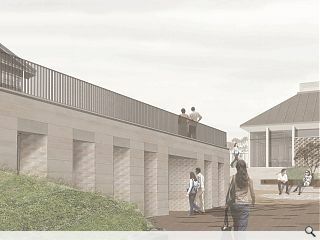 As part of this work visual arts body Collective and Edinburgh City Council will open the classical observatory complex and grounds to the public for the first time. Esh regional managing director Simon Phillips, said: “Historically, Calton Hill was a place for stargazing, but it will now house one of the finest visual arts spaces in the country as part of a wide-ranging attraction that will be open to all. Malcolm Fraser Architects first conceived of the visual arts hub with Collective Architecture subsequently progressing the proposals from planning through to on-site delivery. As part of this transition project architect Emma Fairhurst, who began on the project at Malcolm Fraser Architects, is now a member of Collective Architecture. Good point. Project architect Emma Fairhurst originally developed the proposals at Malcolm Fraser and is now working for Collective Architecture. I've updated the piece to this effect.